Ahmed Shaaban: Tortured to death by Egyptian police? It was with a heavy heart that I read the story of Ahmed Shaaban - another young Egyptian allegedly brutalized to death by Egyptian police at Sidi Gaber police station in Alexandria on 7 November 2010. 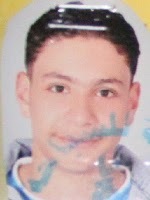 According to Ahmed Shaaban's family, as reported by Amnesty International, the 19-year old disappeared in police custody on 7 November 2010 after he was arrested at a police checkpoint and transported to the now notorious Sidi Gaber police station in Alexandria. On 11 November 2010, the family was informed that the young Ahmed Shaaban's bruised body had been found in the Mahmoudia canal. It is worth mentioning that the death of Ahmed Shaaban comes only 5 months after another young Egyptian - Khaled Mohammed Said was reportedly tortured to death by Egyptian police in the same police station. Egyptian bloggers have expressed concern about Egyptian police brutality and the recent role of the Sidi Gaber police station - raising an important question: how many more young Egyptians have to be tortured to death before police brutality in Egypt is stopped? The role of the police is to protect; not torture civilians. Egypt consented to the Convention against Torture and Other Cruel, Inhuman or Degrading Treatment or Punishment in 1986 and thus has an obligation under international law to protect civilians against torture. Needless to say, drawing from many reported cases of torture by state agents, the state has failed so far to meet this obligation. Amnesty International has urged Egyptian authorities to fully investigate the death of Ahmed Shaaban.